"As a child, I spent a lot of time at my father's research lab, peering through microscopes and looking into cell culture dishes which were sometimes color tinted. Although it was only play, it made a strong impression that crept into my thoughts and work later on. When I graduated from The Boston Museum School, having concentrated in photography and sculpture, I had no plans or experience with fibers. This came by chance when I first started designing sweaters for my two small sons. We had moved to the north coast of Maine near the Canadian border. The winters were long and cold, and I wanted to make my boys warm clothes. I became influenced by the changing colors of the seasons and the art and clothing of Eskimos and Laplanders. Patterns and designs of the cell cultures began to creep into my sweaters, along with silhouettes of running deer, swimming fish, and prayer puffins. I found the shorter and darker the days in winter, the more I used bright colored homespuns. 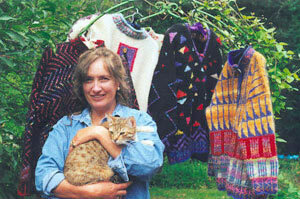 And I discovered that design and color created strong forces within the fibers that allowed me to have a dialogue within the shape of each sweater. Two important elements which always help finish the sweaters, buttons and velvet ribbon, have taught me that they are as important as the body of the garment. Abalone, nautilus shell, caribou bone, and walrus ivory buttons capture the north coast where I live. The finishing velvet trim, sewed onto the neck, cuffs, and waistbands, plays a strong color and texture role and helps frame the sweater. My work in fibers has performed a complementary part with the use of colors and design in my paintings. Usually I am working on a painting and sweater at the same time, and the color hues and shapes often reflect back and forth between the two mediums."